IMSA is an institution whose mission is to provide a model for innovation in advanced study in mathematics and science education. As such, IMSA's resources benefit from significant external sponsorship. The Grainger Center was made possible through the generous donation of the Grainger Foundation of Lake Forest, IL., established in 1952 by William Wallace Grainger - founder of W.W. Grainger, Inc. It is a recipient of the Merit Award in the 1999 Design Awards & Exemplary Learning Environment Program. 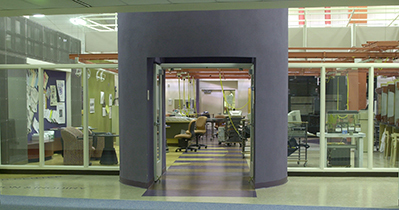 This remarkable space for student scientific research features mobile workstations and mini-labs, which can be grouped for collaboration or independent work, and flexible data and power hook-ups. The Grainger Center supports research in all scientific fields from the traditional sciences to technological innovation and expands IMSA's physical space for "electronic and scientific tinkering" through the Student Inquiry and Research Program.